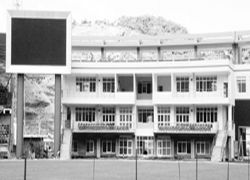 Grenada’s preparations for the ICC Cricket World Cup 2007 have received the nod of approval from the ICC Venue Tour team. The ICC Venue Tour, comprising all event stakeholders, visited Grenada to assess the country’s readiness to host Super 8 games during the tournament. “It is beyond one’s imagination – totally amazing to see the progress made and the quality of work delivered on this project in such a short period of time,” said a member of the ICC Venue Tour. After a 90-minute debriefing session with the LOC, ICC CWC 2007 Managing Director & CEO, Chris Dehring, and ICC CWC 2007 Venue Development Director, Don Lockerbie, told the local media that the ICC Venue Tour officials had high praise for the work done and the progress made. However, there was concern with the state of the external works. Minister of Sports, Roland Bhola, assured the visitors that all the external works and infrastructural developments related to the event would be completed on time. The cricket facility at Queen’s Park is being constructed by the Chinese Government as part of a grant package. Construction started in November 2005 and is expected to be finished next month. Grenada will host six Super 8 matches in ICC Cricket World Cup 2007 from April 10 to 20, 2007.